My grandparents, Doran and Dorothy McEntire, are people you could only hope to know. They have always been the constant in my life of unending change. My mother moved us around a lot, and home, she would say, could be a cardboard box as long as we were together. But there was always one place we could go. One place that would always be a home for us and that was grandma and grandpa's home. They have an underground home on a farm out in the country. Their home is located in the Ozarks of Missouri where they have lived for the past thirty years. However, they weren't always so grounded. In their younger years they were what some people would call gypsies. Always moving. Always on the go. And over the years of traveling they have collected a trove of experience, knowledge and exciting adventures. I love to hear their stories and listen to their wise words learned through experience. But of all their stories and the many I keep close to my heart there is one that sticks with me. It's the story of the Silver Helmet. My grandpa is a godly, honest man and he worked hard as an oil rigger for many years to support his family of nine. He took jobs wherever he could find them. Some of the jobs he took often moved him and his family to foreign countries like Ecuador and Guatemala. In 1974 he found work in Tehran, Iran - a country on the verge of a revolution from the Shaw, Mohammed Reza Pahlavi. He worked and lived there with his family for three years. While he was there he came upon a very talented Iranian Silversmith. Grandpa admired the man's work and asked him if he could decorate his safety helmet. The silversmith set to work, he filled the helmet with tar and then craftfully, he hammered in an intricate mural of shepherds, animals with scenery around it. It was beautiful. Every once in a while Grandpa would get a break from his work abroad and he would come back home to the states to visit his mom, Hazel and dad, Elzie (my father's namesake). He showed his new helmet to them, proudly sharing the bit of beautiful, Iranian culture he had brought back with him. My great grandpa, Elzie, was very impressed! He said he wished he had a safety helmet like my grandpa's to wear to the oil rig that was drilling on their land. He thought it would be fun to show off to all the riggers. Inevitably, my grandpa had to return to Tehran. 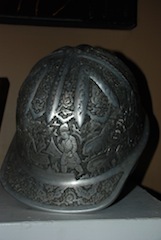 And one day he revisited the silversmith, asking him to make another helmet. A special helmet for his dad. So, again the silversmith set to work. Crafting a helmet made entirely of silver with the same beautiful scene he had hammered on grandpa's helmet. The finished piece was stunning. Grandpa's visits home to see his parents were rare but he gave the helmet to his father the very next time they met. My great grandpa Elzie was proud to have such a special item. He kept the helmet polished and beautiful at all times. He died in 1985, two years before I was born. And in 2004 my grandpa passed the silver helmet down to me. I never met my great grandpa but I know he had to be a fantastic man to have raised my grandpa. In a lot of ways I see my great grandpa in me; like the way he would polish his helmet and was so proud of it. He took pride in things, like gifts and what you work for and so do I. I keep the helmet on my mantel above the fireplace and keep it polished just like he did. Although my great grandpa is gone I can still keep his memory alive. His memory is with the silver helmet. Keeping memories alive is something I am passionate about. Starting around age 10 when I realized there were very few pictures of me as a baby, from then on pictures, stories and heirlooms have meant so much. For their history that will live on as long as we keep it alive. I thought it was very boring. What a beautiful story. It is so important to keep those memories alive. This touched my heart and quite honestly being an emotional person I had tears welling up in my eyes. Loved it and will never forget the story of "The Silver Helmet." "I remember my Mom or Dad or Grand Parents telling me about...."
I enjoyed reading your short story on the helmet/s, it was short but concise and I can sense how proud you are to be the owner of the silver helmet. I guess that is how you will differentiate it from your grandpa's helmet right? I wish you much success in your writing career, I say career as you have the potential to write and that my young lady is a God given talent. Great Gramps would be Proud!! I can sense you love your memories. Hang on to your stories... write them and tell your stories as you live them... each and every day of your life!! When they are written, life stories aren't lost, and those coming after you will know they came from people with sterling silver memories!! May God bless you and give you many other talents as well!! OK, enough history. I truly love your true story. I like the story line and the wording is beautiful. Dedicate this gift to the Lord and see where He takes you. I am a Christian amateur writer and God is using this gift to greatly bless me through a facebook minestry. I became acquainted with your grandparents through facebook. My wife, Karen, and I met Dorothy, Doran and Karol Ann a short time back when they were visiting grandchildren in Tulsa. We live in the Tulsa area and met them at an area restaurant where we had dinner together. What lovely people they are! It was like we had known them forever. May God bless you and your lovely family and may He bless this and all other gifts that He has given you. What an amazing and wonderfull story!!! It was so wonderful to read this story. I almost passed it by, but the picture caught me up short. I remember this helmet at Grandma and Grandad's place. I always loved to hear stories and see pictures from all of Uncle Doran's adventures. thank you for sharing this story, you have brought back some wonderful memories for me! And you are right, Grandad Elzie was an amazing man! I enjoyed so much this opportunity to get to read the story from in your heart of your So Sweet family, your Grandpa, Doran, and your Great Grandpa. My husband Bill and I have been blessed in getting to spend precious and Godly, Loving moments in your Grandparents , Doran, and Dot's loving and interesting home. To spend moments getting to love them, as our family, causing it to be easy for us to love you, too. Your Grandpa, Doran, has so many interesting valuable items, to him, in his special room, being treasures to him. He loves speaking of these and letting us know from where, or from whom they came. I would love to have gotten to also spend moments with your Great Grandpa! I believe your story,Dorothy, The Silver Helmet, is a blessing for one to read, and also find it being rewarding. May you be richly blessed your journey, with Jesus, and your love ones, in this life,eternally! Your beautiful story is anointed with love which is the greatest gift of all. God bless u, sweetheart. I enjoyed reading your story about your Grandpa and your Great-Grandpa and their silver helmets. This precious gift which is now yours shall for your entire lifetime be a warm and tender reminder of their love for you. You are Blessed! I love this story. What a wonderful story of family and keeping the family history alive and and passing it down to generation after generation. One of the best stories I have read in a long time. Very lovely story, from a devoted Great Grand daughter. Thank you for sharing this short story with us. I am a friend of your Grandmother Dot. It is truely an amazing story. Thank you for sharing..
A VERY TOUCHING STORY FILLED WITH LOVE AND ADMIRATION. YOU BROUGHT A BEAUTIFUL MEMORY ALIVE THAT CAN BE SHARED OVER AND OVER WITHIN YOUR FAMILY. GREAT JOB!!!! Love that this young lady knows the value of family ancestry and history.